April has been another strange month. Its been cold, wet and dull for most of the month, to the extent that any gardening was out of the question. Then we had a very short three days of sunshine and temperatures at least 10 degrees higher at 26c. And did we get out to work in the garden with around 90 people coming around the garden on the 22nd! We were lucky that day was also dry although there was a cold wind. But the last week has gone back to where we started, cold, wet and windy. At last colour is coming back to the garden with the tulips bursting out. Looking down on the garden we can see the the lawn has benefited from all the rain. The alliums have also grown at an incredible speed, in some cases bloting out the tulips. Looking further round to the left the wall across the garden is about to burst into life and the Tulip Red Impression that fill the left hand border are coming into flower. Tulips are the main feature at this time of year in this part of the garden. the Red Impression always works well against fresh green foliage and also the purple honesty. Last year under-planted some roses with Anemone blanda atrocaerulea. the idea was to give some interest when the roses are only just coming into leaf. It is great to see it working again. The bed to the corner of the wall is full of tulips and far to many alliums! When we get some gardening weather I shall remove some of them. The red tulip, Tulip Ad Rem at the back of this picture were planted in 2014 and continue to put on a good display. Tulip Hageri Splendens is now in flower across the stoned edged circle bed. This was planted at the end of 2016 and are coming back well. One of my favourite tulips is Tulip Ballerina. It was great to see some frog spawn in one of our ponds and now it is tick with tadpoles. This small pond does not have any fish in it so the fish do not eat the tadpoles. however, if it were warmer I would expect to see grass snakes having a feast. Looking back a year at End of the Month View – April 2017 its is amazing to see how behind the garden is this year. In April 2017 there were roses in bloom, apple blossom on the trees and the first swallows arrived on April 3rd. No sign of them yet this year! In many ways we are four weeks behind normal. The poor weather and a week skiing in France has resulted in little work this month with the exception of the three days mentioned above. 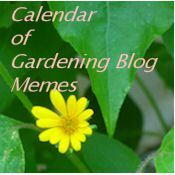 Do have a look at Helen The Patient Gardener’s blog where you fill find links to other gardens at the end of April. Thank you to Helen for hosting this meme. Those tulips really stand out. Are they grown as annuals there, or do they regenerate as perennials? Hi Tony, we leave the tulips in the ground and most come up each year. However, we do plant about 500 each year to replace failures. It must be nice. They do not get enough chill here. We grow them as annuals, but they are expensive and do not last long. They can bloom for a few years in some spots, but I can not figure out how, since those particular spots are not unusually cool. As well as beautiful borders and tulips, the lawn is splendiferously green and lush. I also would like to know about annual v perennial when it comes to tulips as I have recently purchased bulbs, and I’m hoping they’ll last more than one year. Some varieties seem better at coming back each year. I have some which are in their 10th year. I think it will vary with location etc. I suggest you plant some and see how many come back. I buy from parkers wholesale where they are very reasonably (100 bulbs for around £14) so the cost is not too much. I love the big splash of color that tulips give the garden this time of year. I like seeing your garden from a high perspective. This always intrigues me for some reason. We are lucky that we have a conservatory on the first floor which looks across the garden. We spend hours in there looking across the garden! The garden looks wonderful and that brick wall is super beautiful. Your spring garden is a delight. The wall must provide a lot of shelter to the plants. Many thanks. Yes the wall is both an asset and a challenge! The red tulips in various varieties really do a great job contrasting with the fresh spring green. I’ve always bought my tulips from Peter Nyssen, I’ll have to look at your supplier. Having bought tulips last autumn from a local supplier I’ve realised how quality makes a huge difference (I had many failures this year from the local suppliers). Hi Christina, I cannot say that Parkers Wholesale are always reliable. Sometimes get the odd one in a bag. However, their prices make me quickly forgive them and they have a huge range. I had a quick look but the prices didn’t look better than Peter Nyssen, actually I’ve already done my order.